Rita Masese, a physician and second year Master of Science in Global Health (MSc-GH) student from Nairobi, Kenya, has a passion for treating blood-related diseases and cancers. Her experience as a physician and desire to make a larger impact on health in Kenya brought her to DGHI to learn how to conduct clinical research. After completing a degree in medicine, Masese began practicing as a doctor in rural Kenya at Tenwek Mission Hospital. But she soon recognized that her community’s needs were far greater than she expected. “I encountered disparities that seemed large, and it motivated me to want to have a broader impact, rather than helping just one person at a time,” she said. As Masese watched others use medical research to inform practices and policies, she decided that she wanted to learn more about how to pinpoint problems and implement evidence-based improvements. Masese is interested in cancer and blood-related disorders such as HIV, sickle cell disease, leukemia and lymphoma. She’s following the shift of disease in Africa from communicable diseases to non-communicable diseases, and she wants to develop more effective treatments. The premature death of a childhood friend also drew Masese to the healthcare field. “All of a sudden, one of my childhood best friends couldn’t come out to play anymore,” she said. “One day I was persistent enough and I was able to see how sick she was—and the next time I asked to play with her, she had passed away.” Later Masese found out her friend had a history of leukemia in her family. That experience inspired her to fight cancers and diseases that often can’t be cured with readily available drugs and build capacity to address those challenges. Masese completed her MSc-GH fieldwork in Tanzania with DGHI assistant professor Dorothy Dow, an infectious disease specialist who works with HIV-infected adolescents transitioning from pediatric to adult care facilities. Many fail to successfully make the transition, so Masese is examining how they navigate the change in order to develop a protocol that will help them transition successfully. Unlike most DGHI students, Masese was closer to home at her fieldwork site than she was in the classroom. “For many students, fieldwork feels like a new world,” she said. “For me, it was the other way around. Coming to the United States was my fieldwork. 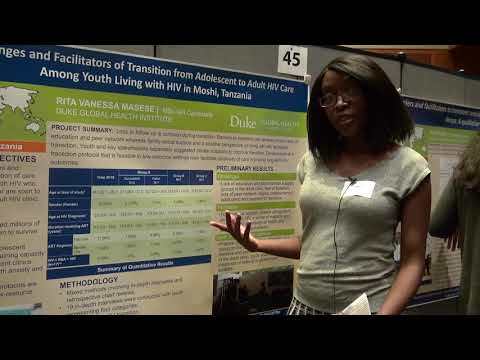 I initially had challenges with transport, I wasn’t familiar with the environment, and I had to become more adaptive and less rigid in my thinking.” Masese enjoyed her fieldwork because she could speak her native language, Swahili, and work with young people with HIV, a population that really interests her. Rita Masese (center) at Tenwek Hospital with Beth Wilson (left) and Haley Peterson-Hostetler (right), two visiting doctors from Duke Hospital. The mentorship extends even beyond the program to all aspects of life. The program is challenging but supportive.